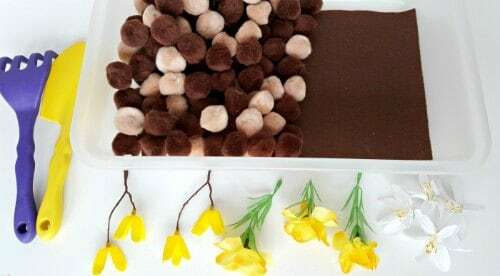 Spring is a great time to get out your sensory bins, and this flowers and pom pom Spring sensory bin is a lovely easy one to set up. 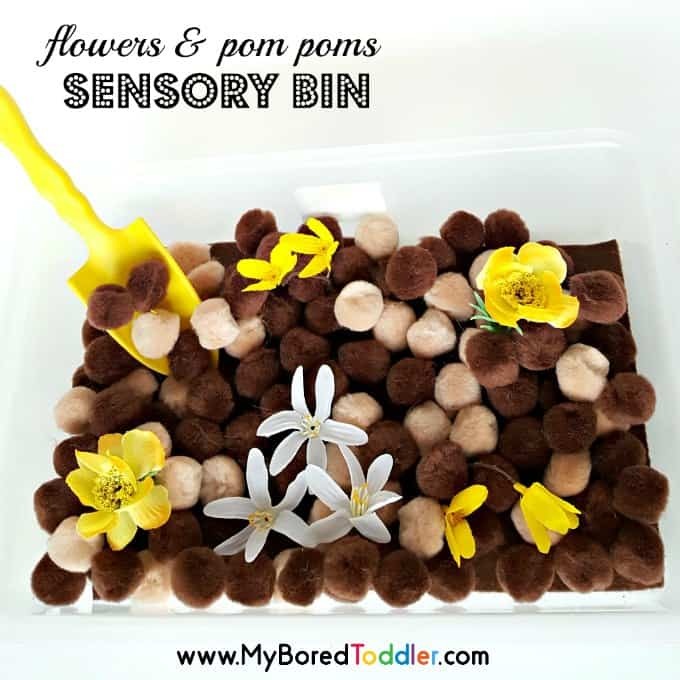 With plastic or cloth flowers added to the sensory bin, you have a colorful hands-on activity for toddlers. 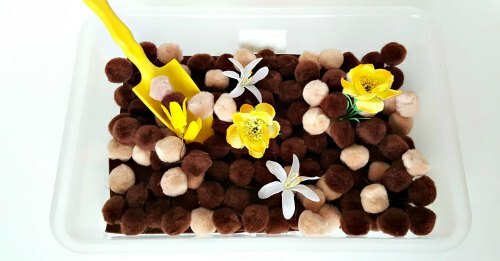 Kids will have fun digging, sorting and matching with spring flowers in the sensory bin. 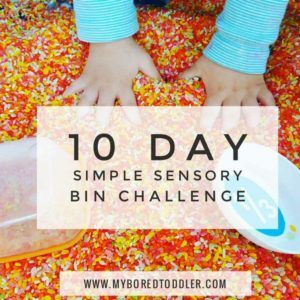 If you’ve been following this page for a while you’ll know how much we love sharing sensory play activities and ideas and our growing collection of sensory bins are some of the most popular pages on this site. 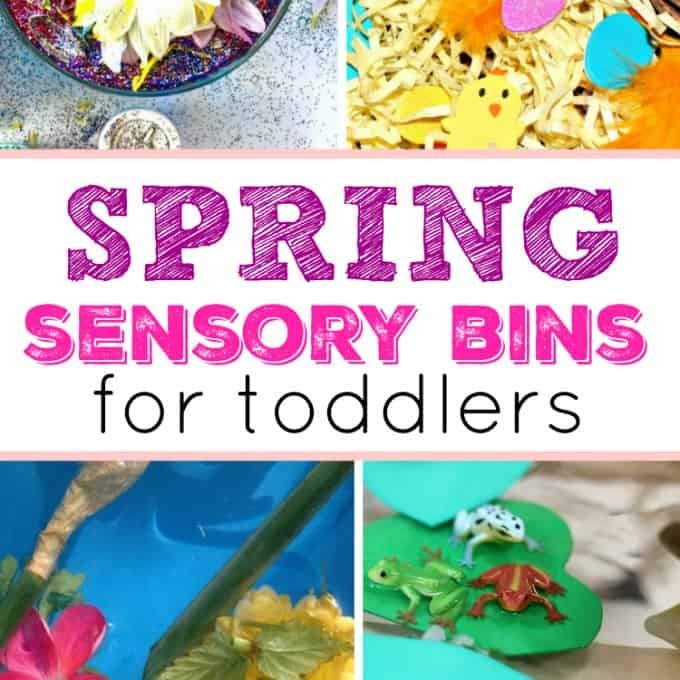 This Spring themed sensory bin is relatively mess free (as mess free as toddlers can be!) and while you could include include real soil, for this one we’ll keep it simple with the t a mess-free alternative using pompoms. As always, if you are using pom poms please make sure you supervise your child well as you don’t want them putting them in their mouths. There are different sized pom poms that you can buy and I recommend getting the appropriate size for the age of your toddler. This activity is easy to set up and promotes some hands-on, mess-free exploring. Line the bin with brown felt. This step is optional; the felt just adds texture. 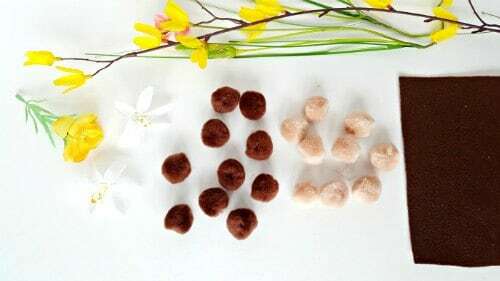 Fill the bin with pompoms in shades of brown, or even black, to represent the soil. Separate individual flowers from stalks purchased at the dollar store or craft store. Flowers should be removed with short stems attached. Use the leaves as well as the flowers. Add craft stick or pipe cleaner stems. 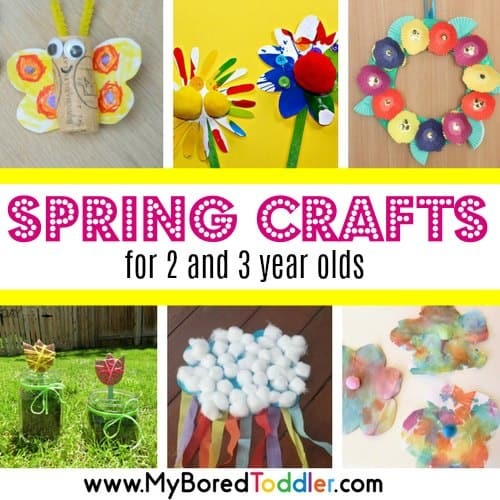 Make homemade flowers with cloth or foam shapes. Cut flowers from magazines and glue to cardboard. Place flowers in the sensory bin along with some digging tools or grasping tools. Squeeze the pompoms with hands and fingers. Dig and pour and stack! Show your child how to ‘plant’ a flower by piling pompom ‘soil’ around the stem to support the flower. Sort flowers by color or size. Match each flower to a stem. Make a pile of ‘soil’ in one corner of the garden. Talk about the colors and shapes as your toddler plays, whether you are hands-on in the activity with your child, or nearby with another task. How many yellow flowers did you find in the garden? This flower has pretty blue petals. Did you bury all the white flowers? 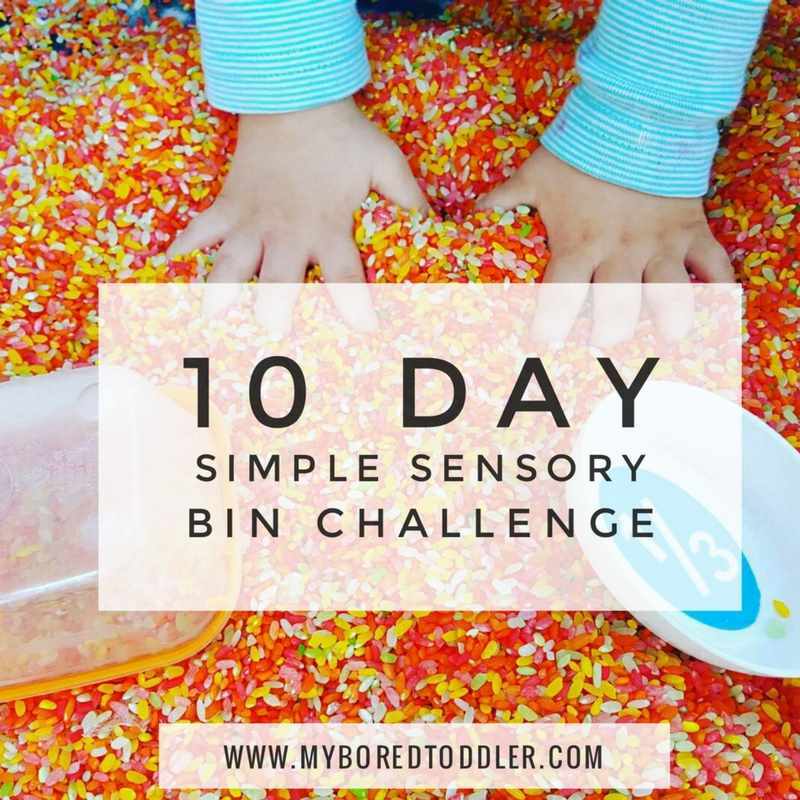 A sensory bin filled with pompoms and flowers has simple set up, and offers an abundance of fun and learning for your toddler. The benefits of this fine motor sensory activity include strengthening grasp, exploring textures, and practising counting skills. 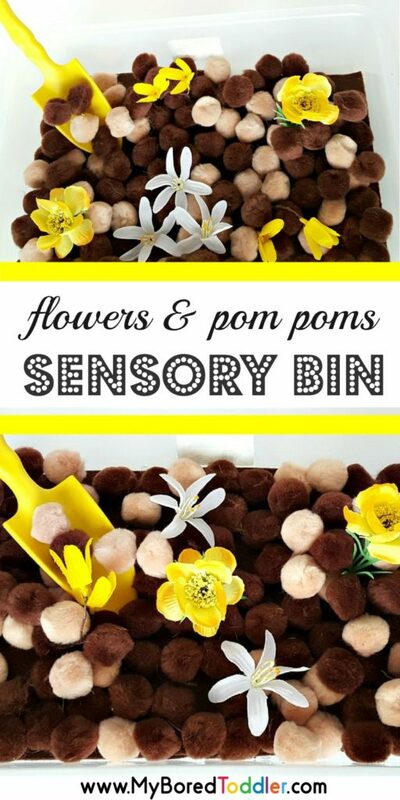 Kids will love planting spring flowers in this sensory bin.